We have several garages on display for you to walk through; a 24' x 24' two-car, two-story Duratemp Dutch, 24' x 24' two-car two-story Duratemp A-Frame, 24' x 24' two-car, one-story build-on-site Vinyl A-Frame, 24' x 24' two-car one-story Duratemp A-Frame and a 24' x 24' two-car one-story Board & Batten A-Frame. Walking through our garages can be a great first step to finding the perfect garage! 24' x 24' Duratemp Ranch a-frame one-story, two-car garage features a full plywood floor, ideal for use as an office, studio or workshop building, finished with white walls, black trim and black lifetime architectural shingles. This garage comes with two 9’ x 7’ garage doors, one service door and four windows. A-frame roof is 4/12 pitch. 24' x 24' Duratemp Ranch a-frame one-story, two-car garage finished with buckskin walls, tan trim and barkwood lifetime architectural shingles. This garage comes with two 9’ x 7’ garage doors, one service door and four windows. A-frame roof is 4/12 pitch. * Display model features optional upgraded 24" x 36" windows $95.00 each. 24' x 24' Board & Batten two-car, one-story garage comes with two 9’ x 7’ garage doors, one service door and two windows and is built to last with solid wood construction. * Display model features optional cedar stain $1,729.00 and red metal roof $2,304.00. 24' x 24' 7/12 A-Frame "Cape" two-car, one-story build-on-site vinyl garage finished with flint walls, white trim and black lifetime architectural shingles. This garage comes with two 9' x 7" insulated carriage-style garage doors with sunburst. A-frame roof is 7/12 pitch. * Display model includes upgraded 24" x 36" windows $165.00 each. 24' x 24' Duratemp Dutch two-story, two-car garage finished with red walls, beige trim and black lifetime architectural shingles. 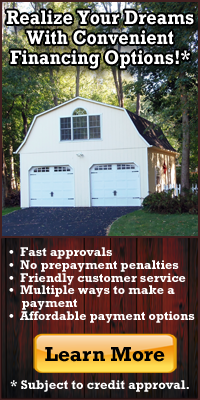 This garages comes with two 9' x 7' carriage-style garage doors with sunburst. 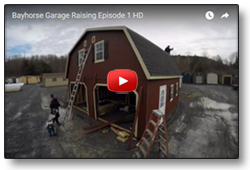 Our Dutch garages feature a gambrel-style roof with two slopes on each side. The upper slope is positioned at a shallow angle, while the lower slope is steep. This roof design maximizes headroom and usable floor space. 24' x 26' Duratemp A-Frame two-story, two-car garage finished with dark gray walls, pearl trim and Williamsburg slate lifetime architectural shingles. This garages comes with two 9' x 7' carriage-style garage doors with sunburst. A-frame roof is 7/12 pitch. 24' x 24' Board and Batten Two-Story A-Frame Garage features two 9’ x 7’ garage doors, one service door and two windows, full loft with stairs, 6”x6” PT timbers for the base (no floor), rough-sawn 2”x4” oak post and beam framing, 1”x9” rough-sawn yellow pine siding (board) slat 1”x2” rough-sawn pine battens to cover seams, LVL headers, 2x8 rafters, LP Silver Tech 1/2” roof sheathing with reflective foil face intended to help deflect UV rays and keep the building cooler in warm weather, 15 lb. tar paper and GAF lifetime architectural shingles. * Display model includes Mushroom stain $4,206.40, 9-lite service door upgrade $140.00, (2) 9' x 7' Homestead Brown overhead doors with glass upgrade $765.00, (4) 30" x 40" brown vinyl windows upgrade $1,472.00, (4) 24" x 36" brown vinyl windows $1,410.00 and B-24 cupola $540.00.